My DJI F450 with Pixhawk inside. You can also see some basic telemetry on the Taranis’ display. As mentioned above, I wanted to build a hackable quad, so I didn’t want to go with a Ready-To-Fly (RTF) model, least of all one that comes with a limited/cheap transmitter, battery charger etc. Building models is fun anyway, even if putting together a quad is not quite the same experience as building a plane out of balsa wood. The DJI Flame wheel F450 shows up in many places around the internet, and it seems to be a reasonably-sized frame, which I hope will offer some payload capacity without being too big, bulky and slow. I decided on the 3DR Pixhawk flight controller for its flexibility and open-source software; I also expected it to be a reasonably mature platform, since I had seen a friend of mine fly a quad with the previous generation APM flight controller. For the transmitter and receiver, I went with FrSky products. Compared to Spektrum it’s a less well-known brand, but their transmitters can run open source software, and appear to provide a lot more value (features, channels etc) for money. This comes at a cost – apparently there’s a steep learning curve, but I figured that as an electronics/computing enthusiast that should not be an issue. FRSky USB-3: for flashing the D4R-II with new firmware that makes 8 channels usable. 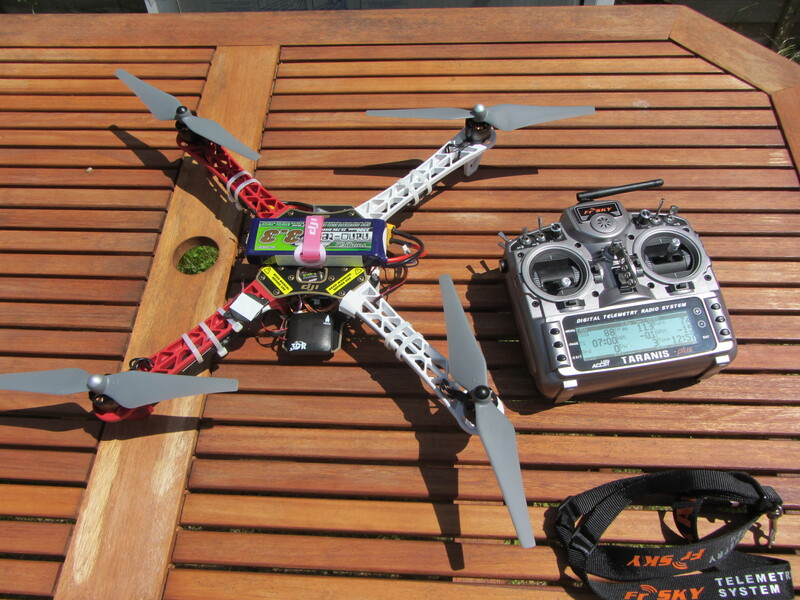 FRSky FUL1: this little device can be fitted between the Pixhawk and the D4R-II receiver to send telemetry data from the flight controller to the transmitter. While I had some past fixed-wing model flying experience, all of my previous equipment was unfortunately outdated (40MHz transmitter, NiMh batteries), which meant my shopping list was a bit longer than originally expected. I did however avoid buying a dedicated telemetry radio system (such as this one) and FPV gear for the time being; I can always add those later. In retrospect, I also could’ve considered the OpenPilot CC3D platform as a low-cost alternative to the Pixhawk. I believe that omitting the FPV gear is actually an advantage in some ways: my quad should not qualify as Small Unmanned Surveillance Aircraft (there’s no way it could possibly do any form of surveillance), and therefore fewer legal restrictions should apply to it here in the UK (see the BMFA guidance on Multirotors with cameras). Disclaimer: I’m not a lawyer, and this should not be taken as legal advice. Assembling the quad was actually surprisingly straightforward, thanks to all the articles on this topic available on the internet. Don’t forget to configure the failsafe options. When I went through the Pixhawk setup process, I had some issues calibrating the accelerometer. This turned to be caused by a faulty accelerometer/IMU, similar to the issues described in this thread on diydrones.com. After a somewhat lengthy RMA process with 3DR, a new Pixhawk arrived in the post. One thing I noticed is that the Pixhawk does not send any PWM signal to the ESCs when it is disarmed. This causes the E300 ESCs to continuously beep the “no signal” tone, which is quite annoying. I might flash them with the BLHeli firmware (see this and this thread) or try to find some other solution to this problem.